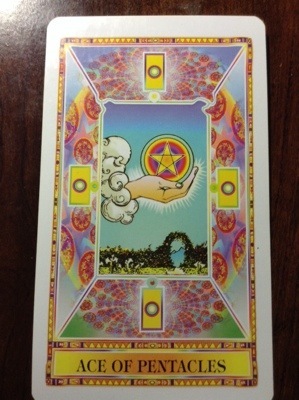 Thursday, we have the Ace of Pentacles with the Moon in Taurus. Ace of Pentacles is sometimes associated with seeds, as illustrated by Ace of Disks in the Thoth. The reason is fairly intuitive when Pentacles are related to the element of Earth. Taurus is an earth sign which will provide a lot of stability and grounding today. It’s like having fertile soil. The Ace of Pentacles in this context would suggest it’s a good day to plant a seed or intention of some sort. Do you have a seed you want to plant?